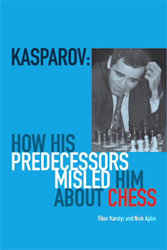 This was written as an imaginary sixth volume in Kasparov’s My Great Predecessor series in which the authors write in the first-person, taking on the role of “virtual Garry Kasparov,” where he blames each of seventy defeats on the bad influence of the previous world champions. The authors note that the idea began as a series of satirical magazine articles, but that it soon grew into a whole book. In fact, one could see it working well in that medium as the joke is best served in small doses. In essence what the authors have done is to take a position from a game that Kasparov lost, find a similar position from which one of the past world champions won, and annotate both with “VK” pointing out how he was misled by the study of those games. In some cases the positions are strikingly similar, while in others it seems a bit of a stretch. Nevertheless, as the authors indicate, Kasparov’s losses are well worth analyzing, and they have found an imaginative and entertaining way to do so, while also including a good number of games from the other world champions.